Last week, I attended the Industrial Internet Consortium’s (IIC) member meeting in Reston, VA. This gave me an opportunity to talk to executives from several companies about their IoT market objectives. In the prior week, I interviewed a C-level executive from an IoT infrastructure services provider on the same topic. What struck me in all these discussions was the competitive tension between short-term and strategic IoT planning. The C-level executive put it best when he described how many of his clients’ sales plans for the coming year are based on implementing bespoke solutions; it’s a quick way to get to market. Where this model breaks down is when companies are implementing their third or fourth IoT applications. At this stage, they are hostage to significant amounts of system integration activity, amongst other issues. This is also the point at which vendor lock-in starts to bite. The equivalent story at the IIC was of companies re-positioning existing capabilities as being IoT-ready so that applications or IoT-enablers could be seen to be generating early returns. If you share the view that the IoT today has many parallels with the Internet of roughly 20 years ago then it’s instructive to look back. In particular, I’d compare today’s IoT developments with the approaches taken by Amazon and Netscape. Netscape was an Internet wonder, offering businesses and consumers new ways to experience the novelty of the Internet. Amazon, in contrast, looked like a different kind of book seller. 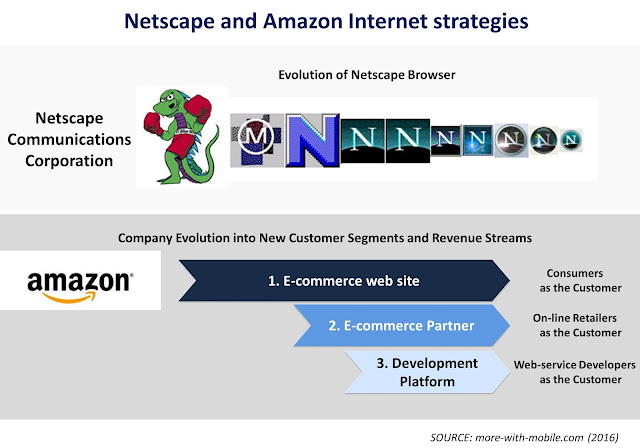 Netscape continued to evolve its Internet browser, eventually succumbing to competition from Microsoft. Amazon evolved its business model, enlarging the scope of its on-line retail operations and leveraging its infrastructure towards multiple customer segments through a platform-enabler business model. Arguably, Amazon’s Internet vision is of the type that companies like Bosch and GE are exhibiting as they apply IoT capabilities to improve their business operations (as distinct from IoT being an end in itself). Towards the end of the IIC meeting, it was interesting to see participants asking fundamental questions about the long term drivers of the IoT. There is a growing realization about the importance of standards. A couple of companies mentioned the mobile industry (arguably, mobile networks are by far the most ubiquitous distribution platform on the planet) and what lessons might be learned about the way companies in the mobile eco-system manage network resources in multi-vendor environments. And, after many years of focusing on vertical IoT applications and then horizontal platform capabilities, it was reassuring to see evidence that companies are (finally) catching up with the importance of monetization. In ‘telco speak’, these depend on the business support services that help service providers and their channel partners to implement multi-part pricing and revenue sharing schemes. They are a necessary complement to established connected-device and application-enablement platforms. So, as conference delegates return to the every-day order of business, it’s worth looking to your executive suite. Is an Andreesen or a Bezos setting your company’s IoT direction?